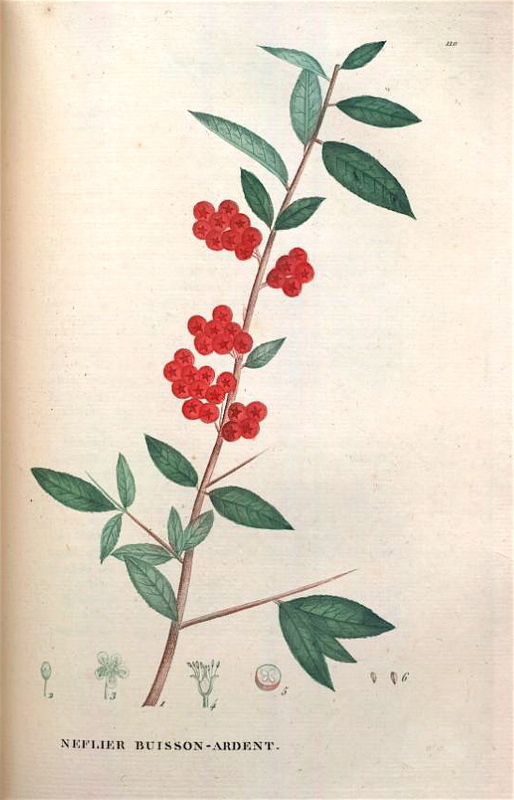 Hortus Camdenensis | Pyracantha coccinea Roem. 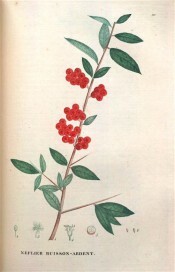 Fully-hardy, dense, bushy shrub with lance-shaped leaves, to 4cm long, and corymbs of small, creamy white flowers in summer, followed by bright scarlet berries. To 4m. [RHSE, Hortus, Hilliers']. ‘Among the Hedge plants which demand the attention of the Horticulturist, are the Buckthorn (Rhamnus catharticus), which makes an excellent fence; the privet, long in use, and a beautiful and verdant inner shelter to the garden, but not a sufficient protection against cattle; and the Mespilus pyracantha, or Evergreen thorn, ornamented in its white blossoms and coral berries.’ [Horticultural Register and Gardener’s Magazine vol.1, p.144/1835]. Introduced to England in 1629. [JD]. Saint-Hilaire Tr. pl.110/1825. Listed in all published catalogues [T.680/1843]. Probably introduced to assess its usefulness as a hedging species. Reported as naturalised in South Australia but not in New South Wales. More details about Pyracantha coccinea Roem.